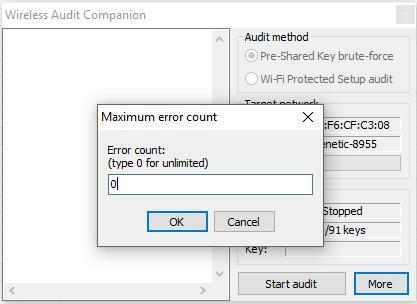 There are not any free Windows-based tools for wireless audit, are there? Router Scan – free Windows program with GUI to scan networks and hack routers – got new amazing features. 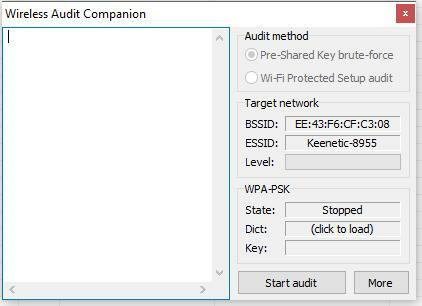 Now you can perform Wi-Fi security audit from Windows. 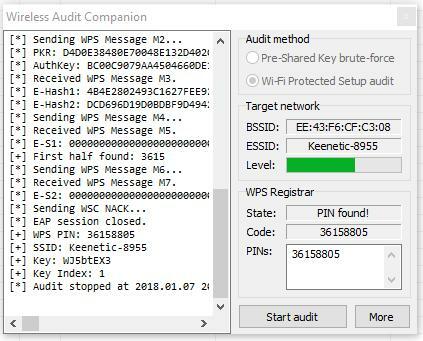 In Router Scan since v2.60, wireless audit capabilities have been implemented, they include brute-force attack against WPA/WPA2 key of a network, obtaining a password using the WPS PIN, and Pixie Dust attack. 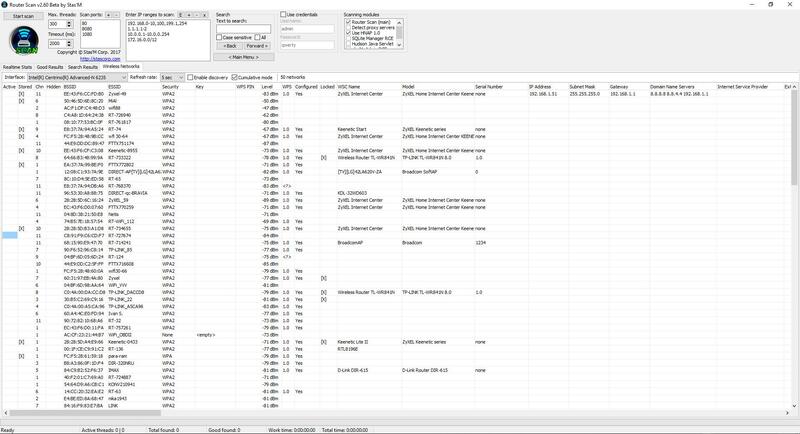 Unzip the archive and run the RouterScan.exe file. 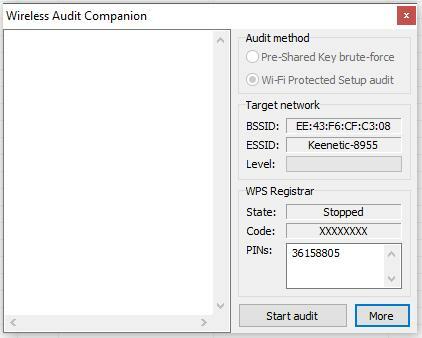 What do I need to use the wireless audit capabilities of Router Scan? [-] Raw packet capture not available. [*] Please install WinPcap and try again. 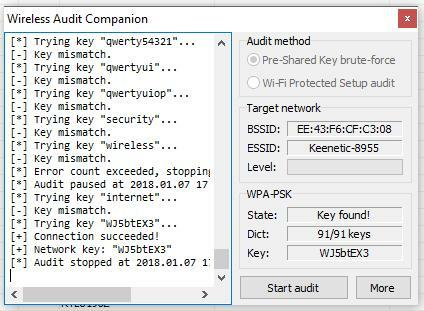 To brute-force WPA-PSK key (in other words, the password from the Wi-Fi network), any Wi-Fi card should approach, since the Router Scan just try to connect using different passwords in ordinary way. If you have several wireless dongles you should give preference to one that sees more networks and keeps the signal better. [-] Failed to start raw packet capture. 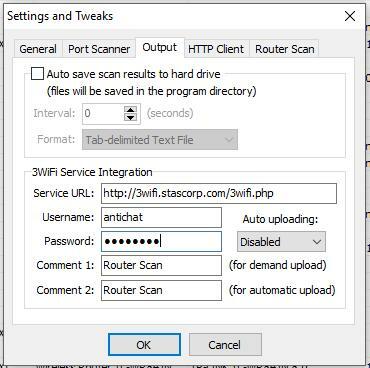 [-] Try updating your Wi-Fi driver and/or installing Npcap in WinPcap-compatible mode. 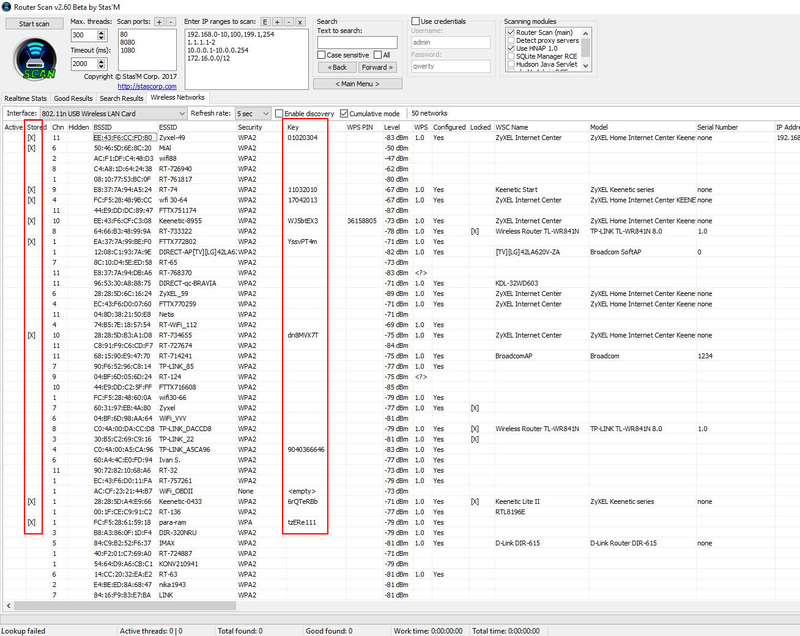 Since my second Alfa AWUS052NH adapter works with Router Scan fine, it is more long-range, and I mostly use it, including Linux, I did not try to cope my issues with AWUS036NHA. Perhaps the problem could be solved in the recommended way. By the way, write in the comments, what wireless adapters work with Router Scan well, and with what problems you occurred. 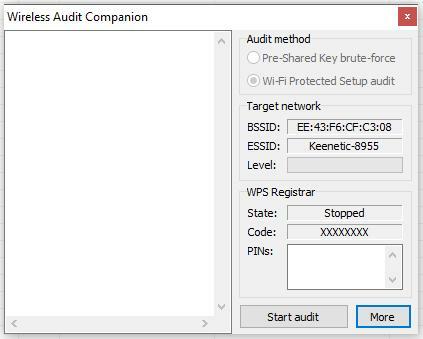 Since WinPcap also contains the driver, I would not be surprised if even wireless cards that are unsuitable for use in Wi-Fi auditing in Linux due to driver limitations are suitable for WPS PIN attacks in Windows. I cannot verify this, because at hand there is no ‘usual’ Wi-Fi adapter. 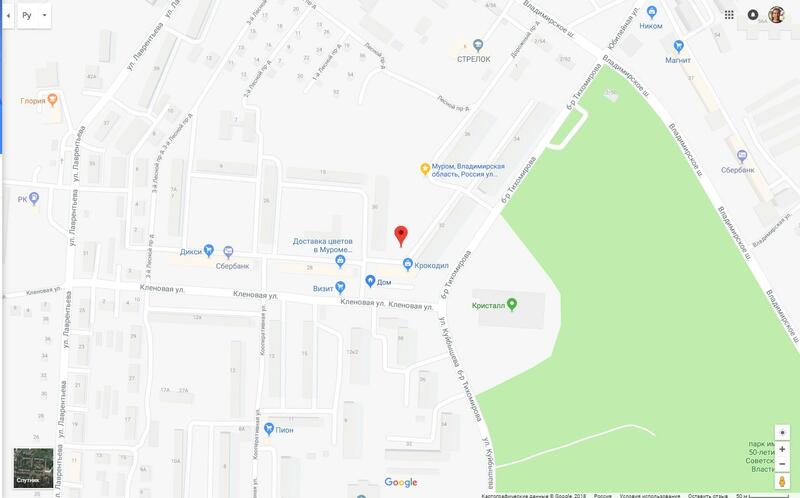 Built-in Wi-Fi adatper Intel Corporation Centrino Advanced-N 6235 (rev 24) (in Linux it supports monitor mode and injection) also works well with Router Scan. The Active column marks (seemingly) the networks to which you are currently connected. Please note that we have access to advanced information about access points. You can see the exact model (WSC Name and Model fields) for the AP with WPS. 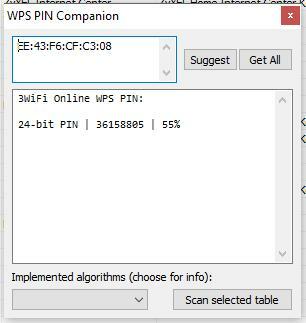 In one of my articles entitled ‘Effective WPS PINs attack based on known PIN and PIN generation algorithms’, I talked about this method of fast Wi-Fi hacking, when WPS PIN is calculated on the basis of algorithms, or taken from the database. If the PIN is guessed, then the password from the Wi-Fi network is revealed. 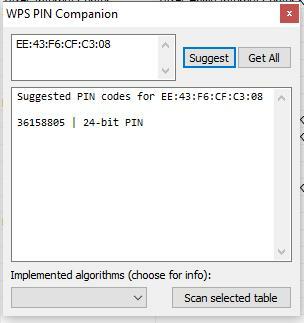 If you already have a WPS PIN (or several pins), enter them in the PINs field. If you do not have a pin, then close this window. As you can see, the guessed pin is 36158805. In it again 36158805 and, apparently, the percentages of coincidence. Our pin is entered automatically, press Start audit. The password from Wi-Fi is WJ5btEX3. The previous method is fast, but works only for networks with unlocked WPS. For all other access points, a more universal but slower method is available. Its essence lies in the fact that Router Scan tries to connect to the Wi-Fi network with a password that it takes from the dictionary. If the connection was successful, then the password is guessed, if the connection did fail, then the program proceeds to the next password and tries it, etc. Next, until the password is cracked or the dictionary is completed. Every attempt takes a few seconds - it's slow. The attack must begin with the selection of the dictionary file. To do this, opposite the Dict field, click (click to load) and select the dictionary file. With the program comes a small dictionary (file wlanpass.txt) for 90 words. You can use it. If you stop and restart the attack, this error usually disappears. The Wireless Networks tab does not work on Linux. Router Scan Stas'M is a unique and easy to use program, it has no analogues for either Windows or Linux. New Router Scan features in many ways are also unique for Windows. However, Linux OS can offer additional tools for attacks on the Wi-Fi network.